This is the floor model Albion press used by William Morris, founder of the Arts and Crafts Movement, to produce his most highly-regarded book, “The Works of Geoffrey Chaucer” (1896). 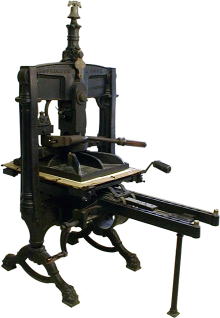 (For information on Richard Whittaker Cope and his Albion press, see the table-top Albion.) Jethro Lieberman: “Manufactured in 1891, Albion Press No. 6551 remained with its maker, Hopkinson & Cope, until 1894, when William Morris purchased it for £52.10s as one of the three full-sized Albions he was to own at the Kelmscott Press. Morris chose this Albion for the formidable task of printing the Kelmscott “Chaucer;” he had the press reinforced with iron bands to keep the staple from blowing up under the extra pressure required to print the heavy forms of this monumental book. After Morris’ death, the Albion was owned first by C.R. Ashbee’s Essex House Press, and then subsequently by the Old Bourne and Pear Tree Presses, before it was purchased by Bertha and Frederic Goudy in 1924. The Goudys brought the Albion to America where it joined the typecasters and other foundry equipment of the Village Press. In 1961, Elizabeth and Ben Lieberman acquired the press after it had resided with several additional printers. When the Liebermans’ Herity Press took possession of the Albion, its history was so much implanted within its iron rails that the machine acquired only a formal name, the Kelmscott/Goudy Press, but also a nickname, K/G. The Liebermans had a Liberty Bell affixed to the top of the press–an alteration approved by the Morris Society, “…as a pledge to the freedom of the press which the personal printer represents and helps sustain.” The Albion, called by the Liebermans “the international symbol of the living personal printing movement,” now resides with their son, Jethro.